With the whirlwind of the past few weeks, it’s not surprising that I’ve been gravitating towards the same sort of products time and time again. I’ve had to find somewhere to live, move house and start a new job! 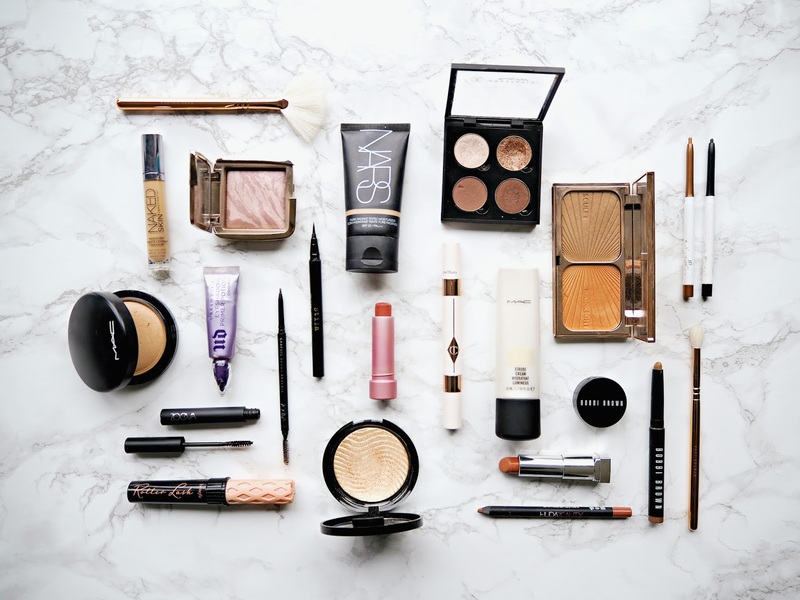 However all that's in my latest little catch-up post and today it’s all about the makeup. I’ve been priming using the MAC Strobe Cream in Goldlite | £24.50 | pretty much every day. I personally think I actually prefer it to the Becca Backlight Priming Filter these days. It’s essentially a luminous moisturising cream that gives my skin the most subtle, golden sheen as well as being nicely hydrating. Of course, before applying my base, I use the Bobbi Brown Corrector (Peach) | £19.50 | to counteract my dark circles. I’ve then been going in with the Nars Pure Radiant Tinted Moisturiser (St. Moritz) | £30. One of the many things I love about this product is that you can easily apply it with your fingers, which is perfect for those rushed days when you need a bit of coverage as quickly as possible. It’s super-hydrating without being at all greasy on the skin and has a lightweight texture. It gives the skin a flawless, glowing, but still very natural look. On a day-to-day basis I generally gravitate towards my Urban Decay Naked Skin Concealer (Medium Neutral) | £19 | because the shade and texture are the perfect balance, making this great both for under my eyes and to hide blemishes on the rest of my face. I talk about this all the time but I don’t care! The hydrating formula makes this a dream to blend out naturally on the skin but it still gives amazing coverage. Just to brighten under the eyes further, I also use the Charlotte Tilbury Mini Miracle Eye Wand (Shade 3) | £29. This is one of those concealer-highlighter pens for under the eyes. This actually has decent coverage and a slightly peachy tone, meaning it also corrects, so if you’re blessed with not having a lot to hide under the eyes then you can probably just use this. I set under my eyes and my t-zone with the MAC Mineralise Skinfinish Natural (Medium-Dark) | £24 | just to make sure my tinted moisturiser and concealer are completely locked in and won’t move or get shiny (even on a long work day). However this isn’t a heavy, caky or drying powder at all; it’s virtually traceless on the skin and actually has a luminous quality to it. As far as highlighter goes, I’ve been reaching for one product over and over again and that is the Make Up For Ever Pro Light Fusion in 02 Gold* | £28. If you’re after a highlighter that will always look natural but still give you that amazing glow, that never looks stripy or over-the-top or glittery: this is it! I only wish there were more shades in the range for me to collect… Gold is as the name would suggest; a true, warm gold shade that really works on my skin tone. After this winter’s love affair with the Make Up For Ever bronzer, I actually switched things up this month and have opted for a neglected product in my collection: the Charlotte Tilbury Filmstar Bronze & Glow in Medium Dark | £49. I actually find this product so frustrating! The light version has a gorgeous pearly champagne highlighter but the bronzer was literally *nothing* on my skin tone. This one has the perfect bronzer but the highlighter is quite dark and orange-toned. I opted for this because I have more highlighters I love than bronzers but I wish it was possible to mix and match the two shades or that this was a bit more of a true gold! I do use this highlighter occasionally but it only really works in the summer when I have a nice tan and want a sunkissed look. So this month I’ve been using just the bronzer shade. It has a pigmented but very natural formula and blends out beautifully on the skin to add subtle warmth and definition. It does have a slight sheen to it, so probably isn’t one if you want a really precise contour, but it works for me on an everyday basis. It’s also such a nice, smooth formula that never looks too much. In terms of blusher, I’ve reverted to an old favourite of late; the HourglassAmbient Lighting Blush in Mood Exposure | £32. I always feel like this looks much more of a greyish-mauve in the pan when it really isn’t once applied; it has a rich, plummy undertone that warms things up instead of washing me out. The formula is just so beautiful too because it doesn’t contain any glitter but you get that ‘lit from within glow’ in your cheeks. It never looks like you're wearing too much blusher; it’s pigmented but looks natural on the skin and applies so smoothly that you really can’t go wrong with it. I of course prime my eyes like I always do with the Urban Decay Original EyePrimer Potion | £17 and Bobbi Brown Long-Wear Cream Shadow Stick in Taupe | £21. I mention these two in every post so instead of boring regular readers, I’ll skim over this step and if you’re interested, you can check out last month’s post. Eyeshadow was an easy one because I’ve found myself reaching for this one quad over and over again! I store these shades in an Anastasia empty quad because they fit all of the brands of customisable eyeshadows that I have (obviously their own, MAC, Makeup Geek and Coloured Raine). In here I have the Makeup Geek Eyeshadow Pan in Shimma Shimma | £6, the Makeup Geek Foiled Eyeshadow Pan in Grandstand | £9.25 and Anastasia Beverly Hills Single Eyeshadows in Red Earth & Truffle | £10 each. Shimma Shimma is a kind of light beige champagne shade that I love for highlighting the inner corner. It’s pigmented but nothing too stark and dramatic, plus it stays in place all day. I then use Grandstand across the lid, which is a stunning coppery rose gold colour with this amazing dewy shimmer and insane colour payoff. I use Red Earth to define the crease, which is an earthy pinky-brown colour that goes with pretty much any warm wintery eyeshadow look. Finally I’ve been using the colour Truffle on a flat shader brush on the outer part of my lid. It’s a warm plum tone that adds the perfect bit of smokiness to the look. In terms of eyeliner I’m using my now-standard ColourPop Crème Gel Liner Pencils in Swerve and Show Me | $5 each. Swerve is now looking a bit worse for wear but it’s a great matte black shade for tight-lining, giving my eyes natural definition. Show Me is a golden-bronze shimmer shade which I use for a soft look on the lower lash line. These have a nice, creamy formula and wear well throughout the day without smudging or transferring. I then do my usual winged liner with the amazing Stila Stay All Day Waterproof Liquid Eyeliner Pen in Intense Black | £14.50. This remains my all time favourite due to how precise and pigmented it is, plus the fact it’s incredibly long-wearing, never smudging or smearing. I have a couple of new brow products I’ve been trying out: exciting! 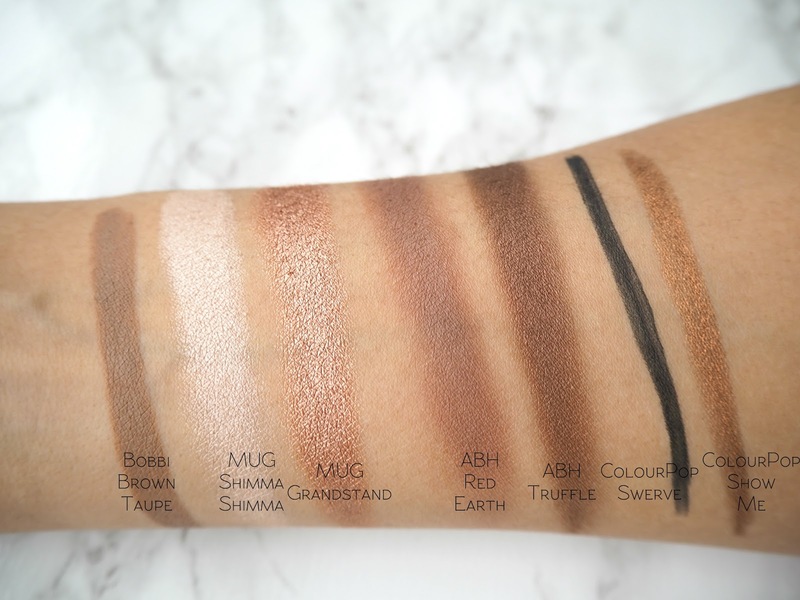 Zoeva recently released a whole host of new brow products (check out my post on that here) and the ones I’ve been reaching for are the Graphic Brows in Arsenic* | £8.50 | and Graphic Brow Fix in Bistre* | £8.50. The pencil is a great alternative to the Anastasia Brow Wiz because it comes in a few different shades, none of which are too warm-toned, so overall they look very natural. This colour is perfect for dark brown to black hair and the pencil itself is quite firm but still has good colour payoff once applied without looking over the top. It’s very precise and has a twist-up function so you don’t have to worry about sharpening it. There’s also a spooly here to brush your brows through with to get a natural look. The brow gel has a really great wand; it’s quite thin so it’s not at all messy. The product itself is a little thinner in consistency than something like Benefit Gimme Brow but I really like it for a soft look. It has a slight tint and holds my brow hairs in place without leaving them feeling too stiff. For mascara I cracked open a new tube of Benefit Roller Lash | £20.50 | this month. I have come round to thinking that this mascara probably isn’t special enough that I’d spend so much on it again (when L’Oreal and Maybelline do great ones for £7-11 and mascaras go off so quickly) but I am enjoying using it at the moment. It's a great everyday option if you want soft, fluttery, long lashes with amazing curl. On really low-key days I’ve been enjoying my old favourite: the Fresh Sugar Lip Treatment in Petal | £20. This is pricey but as you can see I’ve more than got my use out of it! Some might say it’s ‘just a tinted lip balm’ but the formula is soooo nourishing, it’s more pigmented than you might expect from this kind of product and I love the colour, so to me I’d rather invest in something like this that I reach for over and over again than a dramatic shade of lipstick I wear once in a blue moon. If my lips are feeling dry, I can just throw this on for a rosy pink wash of colour and some serious hydration. 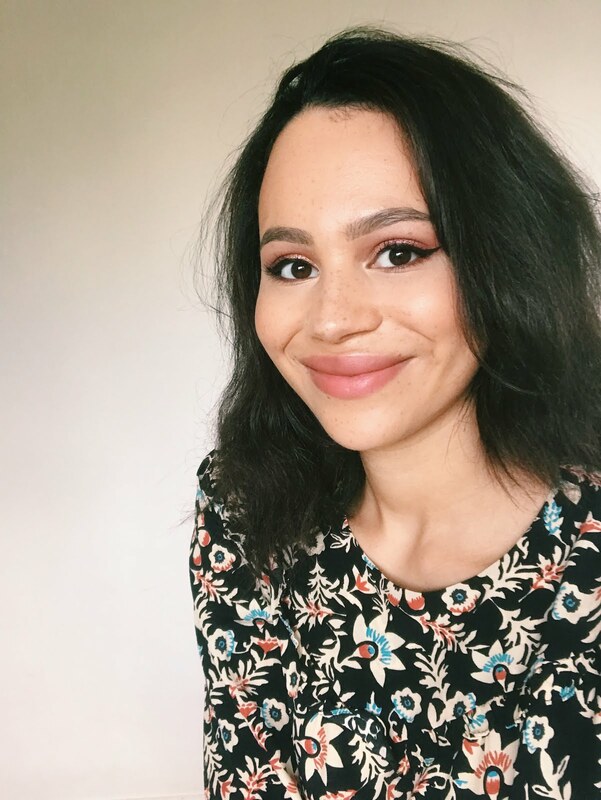 When I want something a bit more fancy and evening-appropriate, I’ve been using the Huda Beauty Lip Contour in Trendsetter | £16 | with the Maybelline Creamy Matte Lipstick in Clay Crush | £6.99. These two are almost identical in colour and both have a nice, creamy formula that feels comfortable and not at all drying on my lips. They give a warm pinky-brown lip look that’s really long-wearing. What have been your staple makeup products recently? Goldlite looks so pretty! I might need to add ABH Red Earth and Truffle to my wishlist! I love reading your beauty posts I always find something new - I'm obsessed with the Hourglass blush, so pretty I have to try it! You have so many lovely products. Slightly envying you right now hahah. That Mac Goldlite is amazing. This sounds weird but, I find the light/medium Bronze & Glow performs much better on the face than it does when swatched on my hand (in which case it doesn't show up at all). The bronzer is subtle but it makes a good everyday contour/bronzer color on my NC40 skintone. The highlighter of course is gorgeous! Just my opinion, if you wanted to try the light/medium version again. Ok, that Mac strobe cream looks amazing and that Bobby Brown eyeshadow seems to have a stunning finish! I use so many of these products! For me recently it has been all about Benefit Porefessional, I never thought I would write that, I have always found primers to be a bit of a fad, but I am in love with it! 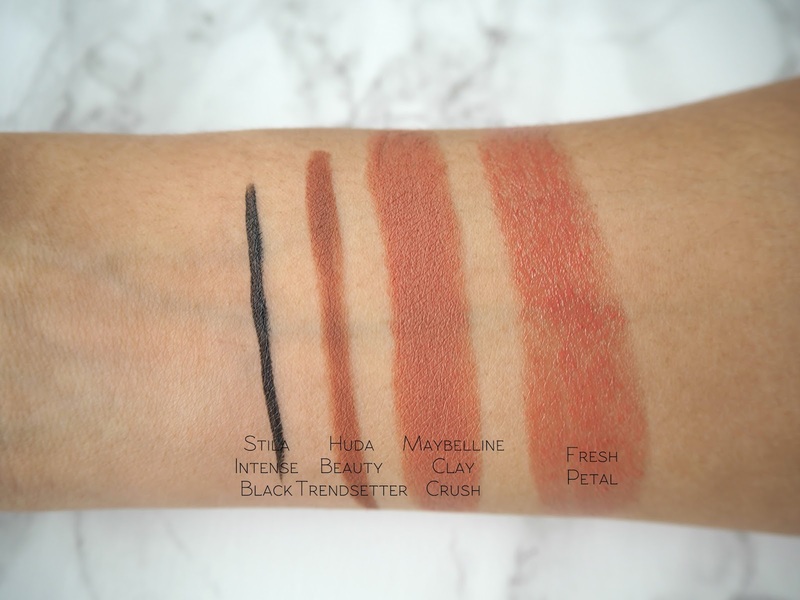 I love the sounds of some of these the swatches all look lovely, I love the bobbi brown in taupe. 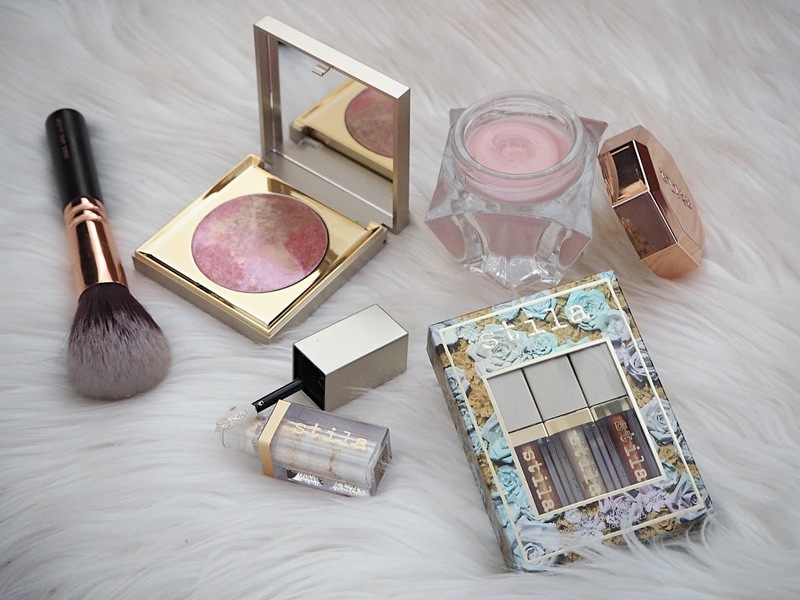 I am still desperate to try that Hourglass blusher! Love your picks! So many good ones in here. 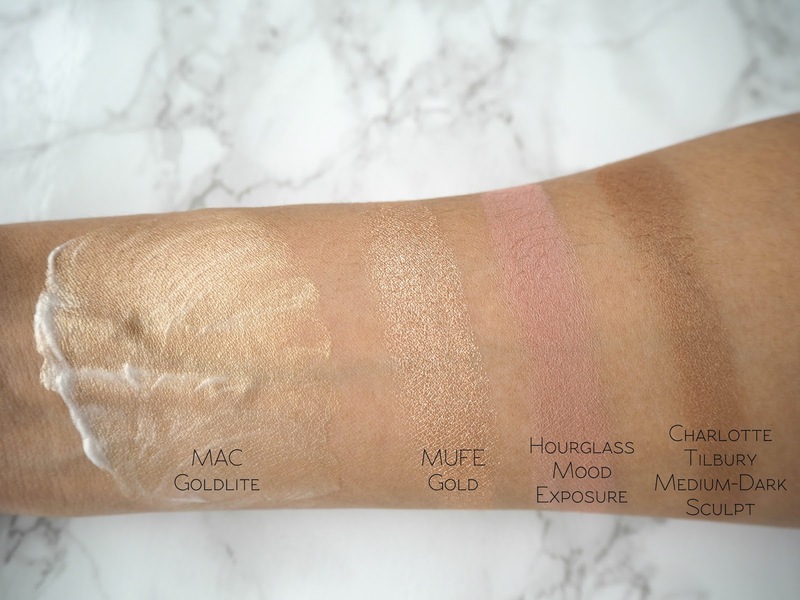 The MUFE highlighter is one of my absolute faves! I do want to try that NARS tinted moisturizer, I have the velvet matte one but I admit I'm not a huge fan of the slight alcohol scent. How unfortunate that the CT filmstar bronze & glow duo isn't precisely perfect, hopefully one day they'll have a mix&match one like ABH. MUG grandstand is gorgeous and I feel like I ooh and ahh over it every single time I see it! I've been minorly obsessed with the Burberry liquid lip velvet in Fawn - it is the perfect everyday shade! I really want to try out the new MAC strobe creams and see the comparison with the Becca one! I'm sill fawning over the CT Filmstar palette. I have quite pale skin most times of the year and I think it would be a great addition. I'm totally with you though on the mix and matching idea, I think that would be amazing!